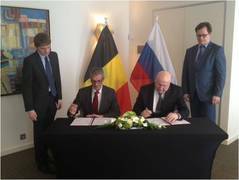 On Wednesday April 2nd, Healthcare Belgium hosted a Nizhny Novgorod (Russia) Governor delegation in Brussels. Valery Pavlinovich Shantsev and Herwig Fleerackers presented their organization. Following that, several member companies of Healthcare Belgium presented their enterprise. After these presentations the Memorandum of Understanding between Nizhny Novgor government and Healthcare Belgium was signed.